One of the things I don’t like to tell anyone is that there are some days having auto-immune arthritis means I don’t go anywhere or do much of anything. I know in my higher mind that these are days spent recovering from doing too much the day (or days or weeks) before. Still, it bothers me to have any days like that when there are so many ways to spend my time. Yesterday was one of those days, so I was glad to see a NaNoBloMo prompt that I could do, even if I didn’t have the hand available to turn it into a blog post at the time. Mary Beth suggested looking out a nearby window, taking a picture, and then writing about what you could see in the picture that you hadn’t noticed while simply looking outside. 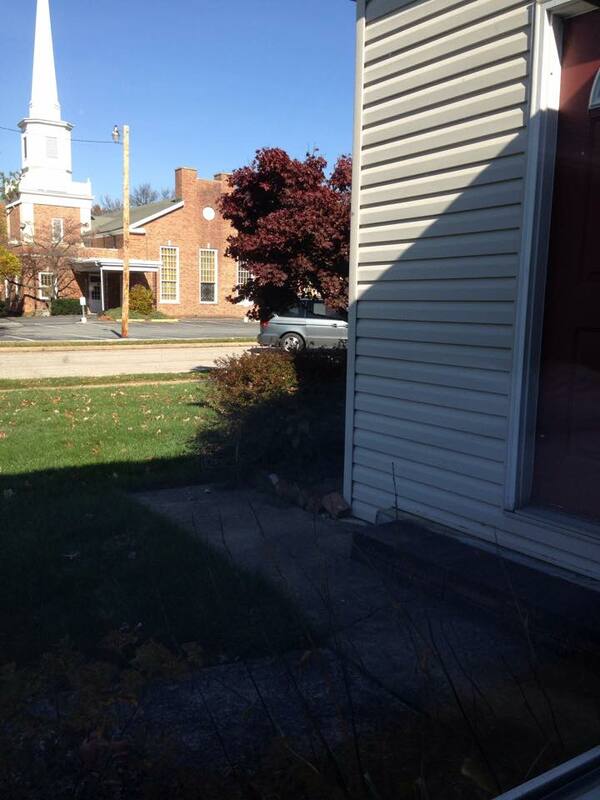 This is the view from our living room window across to the Presbyterian Church. It is a view I love, and I was hard-pressed to imagine what I would find that I hadn’t noticed before. Meanwhile, kathrynzj was coming home with a load of things from our townhouse in the back of her van, and she pulled into the driveway, then backed out again to turn the van around. I took the picture at that moment, having no idea she was back from her errands. I didn’t type anything yesterday I couldn’t manage on my phone with my left thumb. (I wrote 0 words for my novel.) Today is already better. 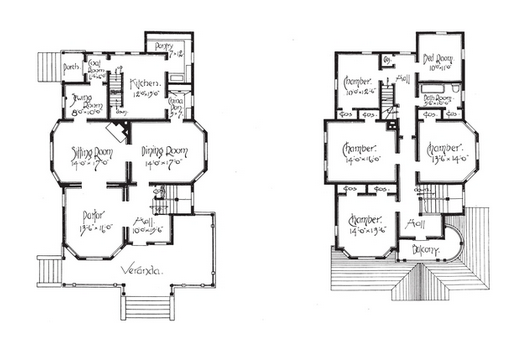 Victorian House floor plan I’m adapting for the family in my novel, from this book. Because you can’t describe a life without knowing where the sunlight comes through the windows and how far the bathroom is from the bedroom. It turns out I am more of a promoter of NaBloPoMo than a participant in it. I have, however, been working on my novel, which is fun, although I do not have enough time for it, not really. Today I plan to spend some time on the novel, some time on a sermon and some time on overdue essays for Lectionary Homiletics, a sermon publication. That’s a full day of writing. Every day this week has been a full day of living. Among the hats I have worn are Long Distance (College Student and other grown up people) Mama, cook, laundress, furniture duster, Pastor’s wife, Bible study leader, non-profit ministry Director (with it’s sub-categories of technical support, Social media minister, event planner and erstwhile visionary), book editor, novice novelist, floor plan researcher, freelance curriculum/sermon resource writer, colleague, friend, Facebook friend, Words with Friends player, step-mom, stationery supply shopper, cat owner at vet (twice, each with a different cat), leader, reader, pray-er, Stewardship letter writer, pastor myself and wife (minus Pastor’s for the times that isn’t the priority). That leaves off a few descriptors for things I didn’t get around to doing. Juggling multiple part-time jobs (Interim Pastor, Director of RevGalBlogPals, writing/editing) requires me to learn compartmentalization, a skill I have both envied and resented in others. This week I spent time on that task by setting up another email just for church and a connected Evernote account that works across devices. That’s my to do list just for church. And the truth is, I really only look at that Evernote in the blocks o time assigned to working at the church. It goes against my nature, but it has to be that way if I’m going to keep to the 20 hours a week for which I am contracted and also have time to do other work and be present to my family. There are a lot of days in this season of life with its delicious if sometimes exhausting fullness when I count on God’s presence more than I invoke it. I think a lot about what God wants for and from me, from RevGalBlogPals, from the church I am serving, even from the church my wife is serving. There is not much downtime in which to regroup, much less to be contemplative, but I can feel the need for it. I made an appointment with my Spiritual Director — much-needed — but I can see the pace is going to continue this way for the foreseeable future. So, I may not blog every day. But I am writing every day, at least a little, and I feel good about it. The last time I voted in Portland, we were voting on marriage equality. We were also voting for a President, a Senator and a Congressman, as well as on other ballot issues. My polling place was the Fellowship Hall and Gym at Woodfords Congregational UCC, my home church before and during seminary. I shook hands with relatives of candidates in the parking lot, then lined up to go inside, where I saw friends voting ahead of me, chatted up the people in line around me, recognized the poll workers, and generally felt delighted to be participating in the democratic process with my neighbors. I did not have to show ID. I filled out 2 card stock ballots (elections and ballot issues) with one of those special black markers, and had the pleasure of inserting my ballots into a machine for counting. It may sound funny, but I always made sure to fill in those lines very carefully while I stood behind the little curtain. Here in Pennsylvania, kathrynzj and I went to vote at St. Peter Lutheran Church, because we haven’t updated our driver’s licenses yet. There were very few people voting. The ladies at the L-Z table were nice; one had her knitting, which I really wanted to ask about, but you know, elections are serious, and these people don’t know me. I signed in opposite an image of my voter registration card, with an image of my signature. I can’t tell you how much I don’t like that. They gave me a white card (blank) to hand to the extremely old man operating the touch screen machine. He made a joke about my Vera Bradley purse and where I got it, but it wasn’t actually about it being Vera Bradley. It was just a lame joke. He lingered in case I needed help using the machine. I stared him down, blankly. He finally moved off. I pushed the screen to get started and looked at the voting screen. It gave me a choice of voting a straight party ticket, for either party. One of the candidates of my party was not someone I could in good conscience vote for, and another election had no Democrat, so in the end I only voted in the Governor’s race. Then I pressed the red “Vote” button above the screen. 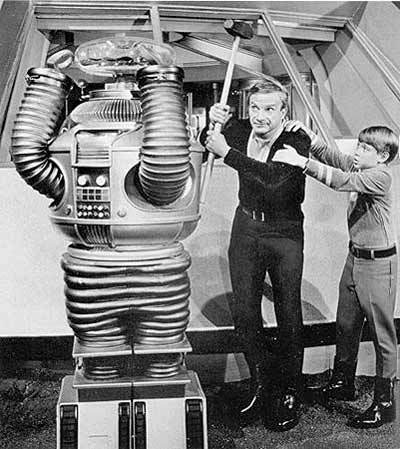 The machine went all “Danger, Will Robinson!! !” I confirmed my desire to pass over some of the categories. Considering there are about 11 Democrats in our precinct, the lack of candidates should not surprise me. On the way out, we did see a familiar face, which made the whole thing seem more like real life to me. Next time around, we will vote across the street, at kathrynzj’s church, where I assume I will know more people, but they will still need to have me sign the book in order to vote. And no matter how many familiar faces I see, it will take a long time before it feels like Portland, where I lived long enough to start meeting people for the second time. I’ve written 2241 words! 1063 this morning. At that rate I’ll get to 50,000 on January 6, 2015. Ah, well. Early morning is a great time for writing except for the fact that I have Rheumatoid Arthritis and wake up with stiff hands. Adjustments may be required. This morning I realized that if I want to write about a family, and that family lives in a house, I need to have a clearer sense of the floor plan of the house. I decided to save that research and contemplation for later, but it actually matters where and how these people live, so it can’t wait much longer if I am to have a hope of upping the daily word rate. I’ll admit I didn’t write (or blog, for that matter, NaBloPoMo) yesterday. Sunday really needs to be a writing Sabbath for me, because by the time church is over, I don’t have much in the way of words. Some of the most fun-sounding NaNoWriMo meetups in my area are on Sundays, which makes sense for people who work at other jobs Monday through Friday. I did finish knitting a Christmas present. On an unrelated note, I have been knitting like a boss all through 2014, and some of my NaBloPoMo will likely be pictures and descriptions of Finished Objects. This is my day off, and kathrynzj’s, too, but it’s more chore day than Sabbath. We’re blessed to have churches that don’t expect much, if anything, of us after worship, so although we start it late, the rest of Sunday really is Sabbath time around here. This morning she found some unopened boxes, so they await me on the dining room table. We’ve only been here six weeks, and we are definitely still unpacking. 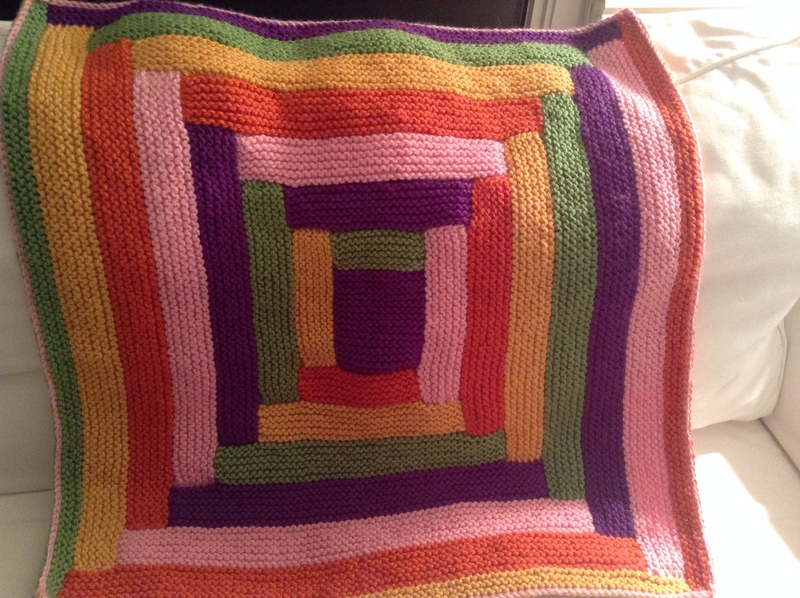 Most recent (non Christmas present) finished object – I have been knitting baby blankets like mad this year. More to come! Today is the day. I did not wake up especially early. It’s dark here! I’m counting on Fall Back tonight to be of help in early writing as the month unfolds. I’m working through the “jump start” 1000 words I wrote to take to my writing group this past week and moving on beyond there. Today also holds the finish (or the start and finish) of a sermon and some liturgical writing, so it’s all writing all the time around here. I’m starting on the laptop, although I have a brand new Moleskine, sharp #2 pencils and a package of the those Staedtler pens available should writing block ensue. 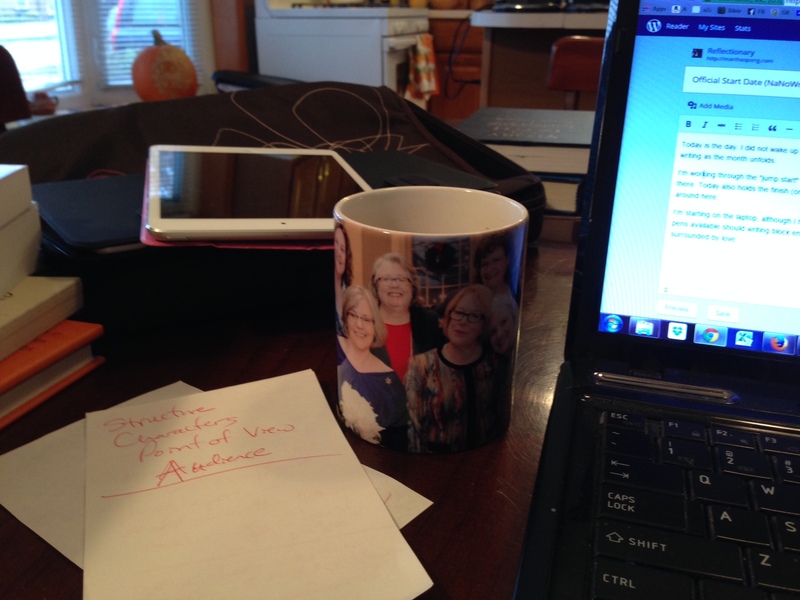 I’m drinking Starbucks Veranda in my wedding picture mug, so I feel I am surrounded by love and encouragement. At least one other person on the mug is doing NaNoWriMo and another is doing NaBloPoMo – which I guess I am doing, too, although I expect my blog posts to be as much about WriMo as anything else.